At its meeting in Havana, Cuba, in May 2016 the Executive Committee decided on a process which shall prepare the WCRC’s association to the Joint Declaration on the Doctrine of Justification during the General Council in Leipzig. With this association the WCRC will become part of the widening ecumenical consensus on a fundamental doctrine, which already includes the Lutheran, the Roman Catholic and the Methodist churches and is affirmed in substance by the Anglican Church. August – October 2016: Consultation with member churches. General feedback on the revised Statement of Association is due by 1 November 2016. December 2016: Decision by the Executive Committee on association with the JDDJ. July 2017: Ceremony of association with the JDDJ during the General Council in Leipzig (assuming an affirmative decision by the Executive Committee). In 1999, after many years of committed dialogue, the Joint Declaration on the Doctrine of Justification (JDDJ) was signed by the Roman Catholic Church and the Lutheran World Federation. In the Joint Declaration Catholics and Lutherans state that the churches now share “a common understanding of our justification by God’s grace through faith in Christ.” They acknowledge that the condemnations relating to the doctrine of justification set forth by the Council of Trent and the Lutheran confessions do not apply to the Catholic and Lutheran teachings on justification set forth in the declaration. The JDDJ establishes this “common understanding” by the method of a differentiated consensus. This method allows the expression of both differences and consensuses by placing the remaining differences within a still more far-reaching shared conviction. The JDDJ presents the different theological traditions but looks at them from the viewpoint of a common understanding as differences in emphasis and not in substance. The method of differentiated consensus has a long history in ecumenical dialogue, e.g. in the Leuenberg Agreement between Lutheran and Reformed churches in 1973. The Roman Catholic Church accepted this method in the process that led to the JDDJ. The JDDJ praises this consensus on the understanding of justification by God’s grace as an important step on the way to Christian unity. For this reason the Roman Catholic Church and the Lutheran World Federation invite other churches and ecumenical bodies to associate with the Joint Declaration. and—in a common official statement also signed by the signing partners and associates of the JDDJ—affirms its commitment to strive together for the deepening of the common understanding of justification in theological study, teaching and preaching. In response to this invitation, the Uniting General Council, meeting in Grand Rapids, Michigan, USA, in 2010, recommended: “To have a consultation within WCRC to consider the possibility of associating with the Joint Declaration on the Doctrine of Justification” [emphasis added]. The issue was discussed at subsequent meetings of the Executive Committee of the WCRC. At its meeting in Havana, Cuba, in May 2016, the Executive Committee recommended to joyfully accept the invitation to associate with the JDDJ. 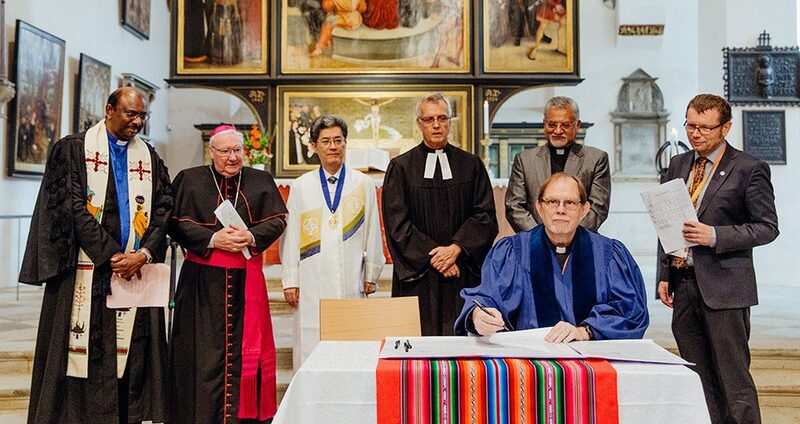 In keeping with the Reformed principle, “ecclesia reformata, semper reformanda secundum verbum dei” (“the church reformed, always reforming according to the Word of God”), the Executive Committee embraced the new ecumenical reality this shared agreement promises. At the same time the Committee resolved that the Statement of Association should emphasize the connection between justification and justice as a Reformed contribution to future ecumenical dialogue on the understanding of justification. As directed by the WCRC’s Executive Committee, this revised Statement of Association is offered for feedback and comments from WCRC member churches by 1 November 2016. In December the Executive Committee will review the responses and, if the way is clear, will take action to adopt the Statement. The WCRC is not bound to formal decisions by its members in this case. The new timeline therefore does not set a quorum which must be reached before the final decision. At the same time member churches are not bound to this association, but are, in fact, invited to have ecumenical discussions on the JDDJ on regional level. During the General Council a common celebration of Christian unity is proposed which will include a public signing of the Statement of Association and the common affirmation of consensus on the understanding of our justification by God’s grace through faith in Christ. Details of the plans for the celebration will be sent to the churches closer to the date of the event being planned.